George Fabyan, having inherited his father’s cotton-trading fortune, purchased a mid-1800s farmhouse and 600-acre estate as a country retreat from his Chicago home. Open to the public May – October with tours available. Wright was commissioned to enlarge and remodel the existing structure. He created a Prairie-style residence with the addition of a two-story bedroom wing to the south, upper- and lower-level porches, three verandahs and large eaves. “The Villa”, as it was called, and its accompanying Japanese garden and Dutch windmill reveals the owners’ eclectic tastes. George Fabyan also developed Riverbank Laboratories nearby, where he pursued research in cryptology, acoustics, physiology and horticulture. In 1939, the couple sold their estate to the Kane County Forest Preserve, which opened the residence as a museum the following year. 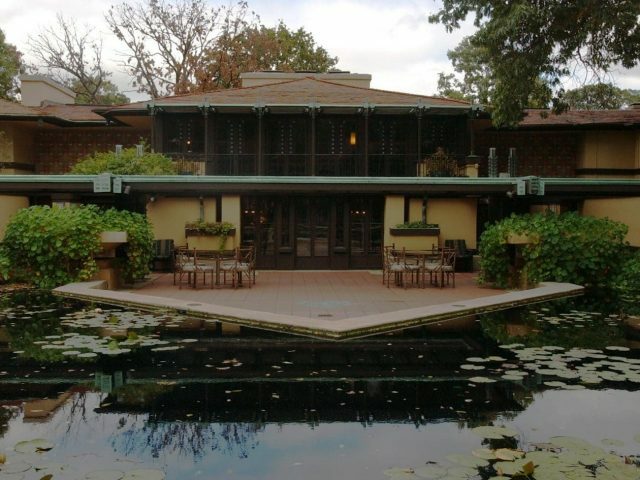 The Preservation Partners of Fox Valley has managed the property since 1995, developing the Fabyan Villa Museum into a historic house museum filled with artifacts and a limited number of original Wright furnishings.